We just checked out Honda's Connect solution for in-car entertainment and navigation, and while it's Android-based, it's not Android Auto -- just Android, period. Still, it's one of the first car companies to offer Google's OS in-dash, despite an odd implementation. For starters, if you're looking for the latest software, it's far from that. The system has stepped back in time to Ice Cream Sandwich 4.0.4, even though it uses NVIDIA's latest Tegra chip. But Android Auto was only just announced recently, which may not have matched Honda's timetable. In addition, the car company has its own suite of car apps that may not be compatible with the latest and greatest Android flavors. All things considered though, it has serious potential -- check our impressions below. Honda's engineers definitely squeezed a lot of functionality into the system, which may suit some folks and not others. For instance, you can download and use Android and Honda's own car-specific apps, including an optional Garmin-powered GPS. Other functions include FM radio, CD playback, USB and HDMI connectivity, Mirrorlink and Bluetooth. While it's great to have choices, we hope all of that functionality doesn't make the system difficult to use. The interface was a bit more fussy than we'd like, which could distract the driver. On the other hand, it's not lacking much in functionality compared to a smartphone, making it potentially more useful than other in-car systems. We were also impressed by the level of tweaking you could do. There are two different basic home screen layouts to choose from, for instance, and you can select your own custom wallpaper. Honda pointed out that you can even modify the wallpaper using an installed photo editing app, something we're not sure is wise in a car. Still, Honda said that it's an automotive device foremost, with features like a backup camera, gas gauge, service alerts and other core car functions. And we definitely like the idea of not being stuck with whatever infotainment features a car manufacturer feels like giving us. We just hope that the final implementation works smoothly, and that all the options don't affect core functionality -- from what we've seen so far, there are still a few rough edges to polish off. 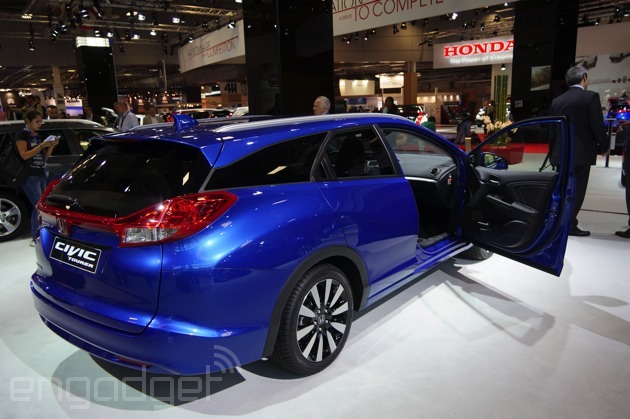 The system will be available as an option on 2015 Civics, Civic Tourers and CRVs.